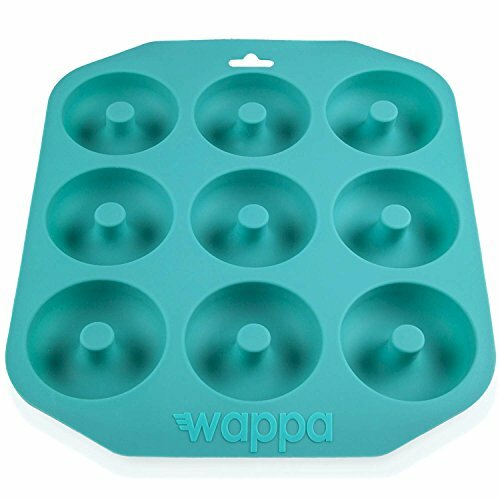 Your search is finally over, as Wappa has taken your needs into consideration and after lots of trial and error - created the perfect silicone donut pan for you. EASY TO USE- CLEAN - RE-USE: You may clean it by hand-washing it or you can just put it in your dishwasher, and leave it at that. The silicone will not allow any dough-type to get stuck in the cavities, and even if they will, they fall off with some warm water, due to the pan's non-stick surface. HUGE & HANDY: Forget about those tiny little forms, through which the dough escaped, all the time - even if it stayed on, you could not enjoy your donut properly, because of its candy-size. We are talking about a family sized pan (14.4"x 12.6"x 1.18") with a capacity of 3 1/2" (9 cm) per cavity. MICROWAVE SAFE: You may easily use it in the microwave, with absolutely no danger of it, melting or causing any other problem to your devices. Highly resistant to microwaves, as well. We produce only the greatest products for the greatest cooks - you may be today among them! If you have any questions about this product by Wappa, contact us by completing and submitting the form below. If you are looking for a specif part number, please include it with your message.